Collaboration applications have become the lifeline of businesses. 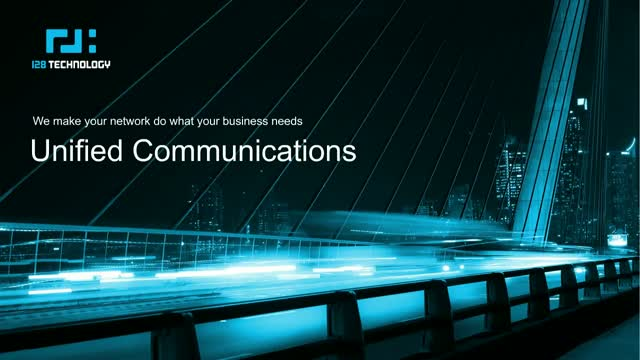 Enterprise communication services, including voice, audio, web & video conferencing, desktop sharing, interactive whiteboards, speech recognition, instant messaging and other services, place specific requirements on the network in order to deliver high quality user experiences. In this webinar, we will explore how Tunnel-free SD-WANs from 128 Technology can enable organizations to prioritize unified communications traffic over WAN links, monitor performance, adjust to network changes, bring bandwidth savings from tunnel overhead, identify applications, and enhance end user experiences. We will review how customers have leveraged this to improve brand loyalty, enable new business, and reduce costs. Organizations are increasingly looking to software-defined wide-area networking (SD-WAN) to improve efficiency and productivity. However, realizing the full promise of SD-WAN requires more than just layering another technology on top of existing connections. In this session, we look at how Redvine and CMC Networks have utilized Tunnel-free SD-WAN from 128 Technology to build next generation connectivity solutions that bring unparalleled experiences for their end-customers. We will discuss unique challenges with capacity, costs, and connectivity that were solved with session-based tunnel-free SD-WAN. First truth: A network that doesn’t know what’s right can never know what’s wrong. Second truth: If things can happen without any record being created, then bad things will be among the happenings. It’s these truths that set SD-WAN implementations apart in terms of security, and so it’s these truths you should be thinking about for a successful SD-WAN deployment. Join Tom Nolle, President of CIMI Corporation and Prashant Kumar, VP of Product Management at 128 Technology to uncover the truth about SD-WAN security and the best practices associated with a successful service rollout. Join Erik Thoen, VP of Product Management at 128 Technology as he discusses important networks considerations for your cloud deployment. Rohit Mehra, Vice President of Network Infrastructure at IDC and Ritesh Mukherjee, Vice President of Product Management at 128 Technology will discuss the important trends for SD-WAN in 2019. Bring your toughest questions and most important SD-WAN challenges to Ritesh Mukherjee, Vice President of Product Management at 128 Technology. As enterprises increasingly consume SaaS and transition to the cloud, revenue opportunities for MSPs are shifting. With this transition, applications are increasingly located outside of branch locations, which makes managing the end-to-end quality and reliability of sessions important. MSPs have opportunities to leverage multi-path routing to manage the edge and WAN for enterprises and to deliver cloud services more reliably by employing SD-WAN technologies. Join us to learn more. IT professionals should embrace zero trust for both SD-WAN and Hybrid Cloud. Leading companies are implementing zero trust principles for integrated protections around data and system, and within the network. There is a validated improvement with zero trust in the network around cost reductions, risk reduction, and agility. Join our webinar to learn how 128 Technology is delivering Zero Trust security. 128 Technology offers a networking solution that has the resiliency, efficiency, and cost savings needed to be truly transformative for remote operations. Whether a business is seeking to centralize its expert headcount and better leverage its most talented employees, expand its service offerings and build new revenue streams, or perform analyses faster than ever to improve productivity, Session Smart™ Routing can make all the difference. Join us to learn more. Removal of tunnels, reduction of bandwidth, end-to-end networking, instantaneous failovers and zero-trust security are superpowers that 128 Technology brings to SD-WAN deployments. In this webinar we will review these superpowers and how customers have leveraged these in innovative ways. Join us to see how 128 Technology can supercharge your network! Your business probably runs on multiple clouds - whether public or private or both. Wouldn't it be great to keep the same network and security policies regardless of who owns the infrastructure? We've got you covered. Want the whole story in 6 minutes? Hear it from our Founder & CEO, Andy Ory, explaining what we do and why it matters in this short presentation. In this webinar, 128 Technology and Light Reading will discuss the benefits of session-smart routers in SD-WAN deployments. Session Smart Networking is different. Session Smart networks can truly simplify the network, as well as provide a breadth of SD-WAN capabilities – including application visibility, software-define branches, multi-path routing and network segmentation. As a result, organizations using a Session Smart approach can realize breakthrough gains in performance, agility, security and scale. Federal CIOs recognize the need to develop “zero-trust” networks — designed around the assumption that every user and every session on the network poses a risk for data compromise. That means finding a way forward, beyond trusted internet connections (TIC) and other perimeter defenses. Find out how agencies are augmenting their infrastructure, using new generation cloud tools, to easily manage network micro-services to govern user sessions and better protect their networks.